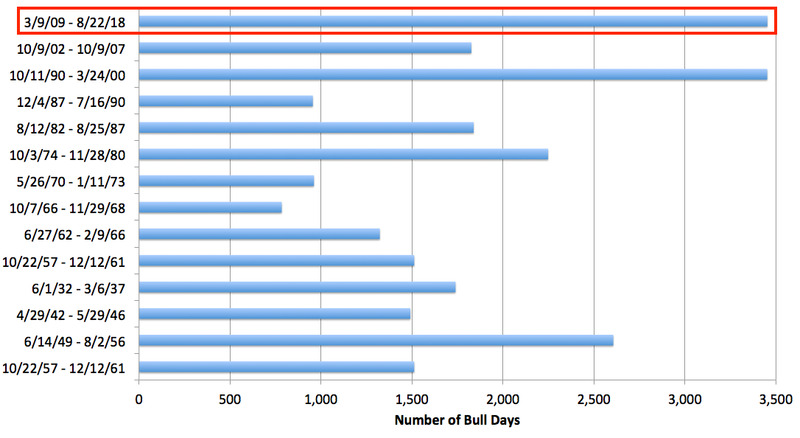 The equity bull market is now the longest on record, at 3,453 days. The benchmark S&P 500 has surged a whopping 323% over the period. As traders celebrate the feat, they have four main drivers to thank: earnings growth, share buybacks, extended monetary accommodation, and a buy-the-dip mentality. Do you remember what were you doing on March 9, 2009? If you were buying the S&P 500, you had impeccable timing. That’s because the equity bull market – which began on that date – is now the longest on record, with an ongoing duration of 3,453 days, according to S&P Dow Jones indices data. For context, a bull market is defined as a 20% rally on a closing basis that’s at no point derailed by a subsequent 20% decline. March 9, 2009 has long been the agreed-upon starting point for such calculations, since that was the absolute bottom for the prior bear market, which ended that day. The S&P 500 has surged a whopping 323% over the period, with its roughly 19% annualized return slightly lagging the historical bull market average of 22%. It also must be noted, however, that not everyone necessarily agrees with the methodology used by S&P Dow Jones. Research outfit Bespoke has been adamant that that the bull market ended on January 26, 2018 – the last time the S&P 500 closed at a record high – since, for all we know, we’re in the middle of a bear-market descent. But to the majority of experts – including S&P Dow Jones and Bank of America Merrill Lynch – it’s best calculated as the number of days from the previous bear market low, all the way through the subsequent 20% increase and 20% decline. By that measure, we’re still firmly in a bull market, especially with the S&P 500 hovering so close to yet another record high. In the end, when historians go back and assess the unprecedented length of the current bull market, they will likely keep coming back to the same four drivers: earnings growth, share buybacks, extended monetary accommodation, and a buy-the-dip mentality. We dive into each one below, and explain their significance to the record-breaking bull run. The engine of the stock market. The backbone of the bull run. The end-all to be-all of equity performance as we know it. All of the above have been used to describe earnings growth on this site – and that might not even be doing it justice. Put simply, profit expansion is the biggest and most important driver of stock returns. Sure, you can make due when earnings growth is receding – as the S&P 500 did over a five-quarter period from 2015 to mid-2016 – but it’s going to be difficult. If you’re trying to set a record for longevity, it’s the most important building block to have. And the 9-1/2-year bull market has seen no shortage of profit expansion. It’s grown in 30 out of 35 quarters, and is currently enjoying its strongest stretch since 2010. Beyond the straightforward fact that earnings growth is inextricably linked to stock-price accretion – given what it means for a company’s future prospects – it can also play into traditional readings of valuation. The ratio of price-to-earnings (P/E) has long been the most popular reading for valuation, and when profits are growing, the denominator in that equation is rising. That can either shrink P/E, or at the very least keep it in check. And that, in turn, emboldens traders to buy more. Over time, buybacks have proven to be a tried and true way to boost stock prices for shareholders without them lifting a finger, because they shrink the pool of outstanding shares. In addition, repurchases can be an invaluable safety net for stock prices – capable of engineering gains during periods devoid of other positive catalysts. When S&P 500 corporate-profit growth shrunk for five straight quarters from 2015 through mid-2016 (as mentioned above), buybacks were there to pick up the slack. Of course, buybacks are only possible when companies have adequate cash. And wouldn’t you know it – the 9-1/2-year bull run has coincided with some of the easiest lending conditions in history. Not to mention the GOP tax law, which totaled $US1.5 trillion in cuts and brought overseas cash flooding back into the US. 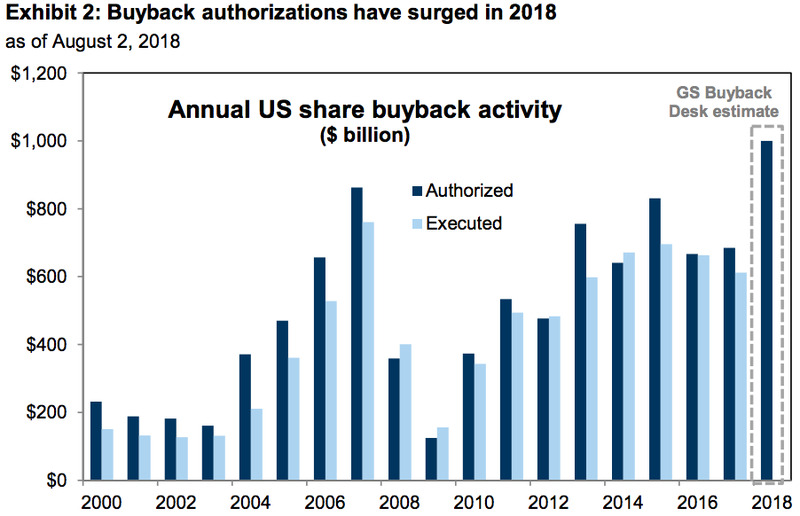 While it may not be what many had envisioned for tax reform, there’s no denying it’s been a major boon for buyback activity. As the chart below shows, Goldman Sachs expects authorizations to reach an all-time high in 2018. It’s not a coincidence that the stock-market recovery since the bottom reached in March 2009 has run parallel to a period of unprecedented monetary accommodation – all courtesy of the Federal Reserve. By keeping lending costs so low, for so long, the Fed has given companies ample leeway to make acquisitions, reinvest in capital expenditures, and sink money into research and development. You know, the types of activities that keep businesses growing, earnings expanding, and share prices rising. Critics commonly refer to this dynamic as the “Fed put,” which they argue has emboldened investors and created a mentality that the central bank won’t let the market fail again. With that said, the Fed has started to tighten monetary conditions in recent quarters, which means the spigot could soon be closed. However, the central bank hasn’t been as hawkish with its policy as many expected, which could have traders unwinding a worst-case scenario for rate hikes they no longer see unfolding. This last driver deals more with investor psychology than any sort of internal market dynamic. But it’s no less important. Throughout the 9-1/2-year bull market, investors who scooped up discounted shares after major sell-offs were rewarded time and time again. Initially, their confidence was perhaps boosted by the aforementioned strong earnings growth, or the other fundamental catalysts listed above. But after a while, the buy-the-dip strategy became embedded as a market driver all of its own. People simply got used to the market rebounding from brief meltdowns, then ending up stronger than ever. Strategists began citing it as a legitimate source of buying power. Of course, it takes an ever-present undercurrent of bullishness to keep dip-buying in play, which is where the three drivers outlined above come in. In the end, all four pillars of the bull market presented here have combined to create the record-breaking situation we’re seeing today. Enjoy it while it lasts.